im so over it, i just cancelled my order. If it comes out, it comes out. I emailed again and demanded a reply. First and foremost, thank you so much for being a loyal fan of the Twilight graphic novel series. Being the editor in charge, I can tell you with confidence that we are doing all we can to get the book into the hands of eager fans, and we really do want it out on time as much as you do. The situation that we are facing is that we have an incredibly talented artist putting all her effort and soul into the project to make it the very best she can. Unfortunately, she has been facing issues preventing her from finishing the beautiful pages on schedule. While we do whatever is possible to support and assist her, there are limits to what we can do, and not wanting to publish anything but the very best portrayal of the story for which fans have been waiting, there are times when things are simply a bit beyond our control. I hope this makes sense, and I assure you that we will continue to do everything possible to release the book out as soon as possible. Thank you so much for your patience and for letting us know that there are still eager fans out there. I will be emailing again and letting them know that, in any other job, someone would be fired/replaced for not making their deadlines. Manga artists do it weekly, US comic artists monthly, and the artists who work on books- like these- make their bi-annual deadlines. I'll also ask about the Kindle only format. I'll email back. Maybe they took my advice and are replacing the artist for not meeting deadlines. They won't just an artist right now. She as a contract with them and there are also other stuff we aren't aware of, plus, would you like to have NM GN Part 1 and 2 in two different styles? Probably not, I just hope she will finish it soon and other publishing things will go smoothly and the release of it will come soon. Eh, they replace artists in American comics all the time. Usually they hire someone with a similar style and it's a pretty seamless process. They blend the styles and it looks great. I thought about emailing SM's publicist. I need to google and find out who she is. I don't really read American comics but aren't they changing the artist when they kind of re-start the series? 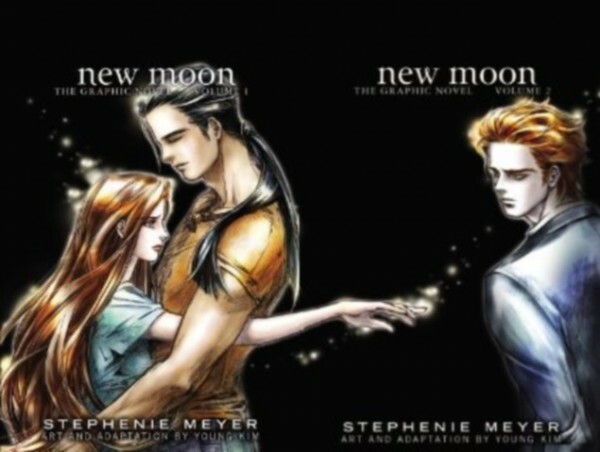 If they change the artist for graphic novels it would happen after finishing New Moon - I think. Why do you want to contact her publicist? Btw. I don't know if I can post here a post like this own on my tumblr: http://hellsbella.tumblr.com/post/92158912025/ ?